10 of the most incredible Rock Climbing locations in the U.S.! There's a big rock reaching up into the sky. You're at the bottom, looking up. Getting to the top is an irresistible challenge. Doing it with little more than your hands, feet and brain makes it even more of a rush. 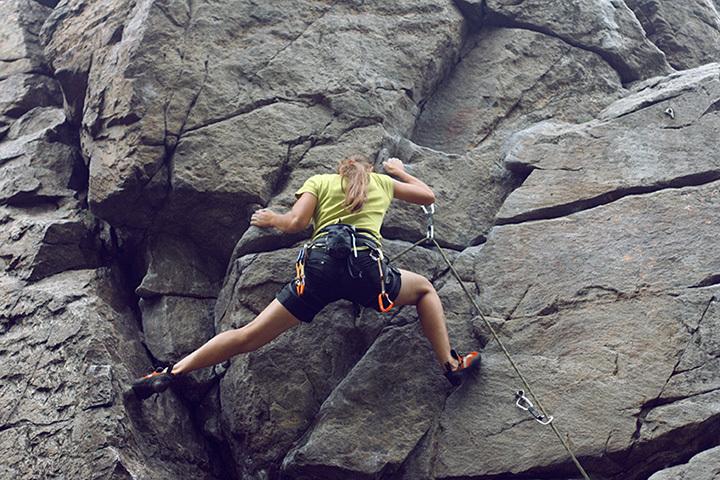 Rock climbing is a twist on that famous saying by George Mallory, who famously challenged Mount Everest in the 1920s. Asked why he wanted to take such a risk? "Because its there." That spirit runs through the sport of rock climbing, too. Ascending a sheer rock face is an intoxicating mix of adrenaline, skill and gravity. If you're ready to get your "carabiner" on, check out ten excellent places to climb here in the U.S.
For something completely different, try your hand (and feet) on the pink granite cliffs overhanging the Atlantic Ocean. There's a nice range of options for all skill levels. Just be sure to check tides and weather conditions first. A true challenge. While it has good friction climbing on its 600-foot dome, it's also known for its demanding exposure and lack of "features." Go for it, experienced climbers. It's a favorite climbing destination on the East Coast. Between the Champe Rocks, Tuscarora Rocks and Seneca Rocks, you have over 300 routes to choose from. The Red River Geological Area features a tantalizing amount of climbable arches and sandstone cliffs. The height of those cliffs may not be impressive (200 feet or so), but the overhanging faces make up for it. Oklahoma isn't a state you'd expect to find excellent rock climbing - but this site, with 350 different routes along its granite peaks - is considered one of the best in the southwest. Because it's a wildlife refuge, there are some restrictions, so check first. It was featured in "Close Encounters of the Third Kind" for a reason: it's totally irresistible. And it's the same for climbers, with hundreds of cracks that assist the ascent, and routes of varying difficulty. There are some restrictions, during nesting time for Prairie Falcons and special times for local tribes who consider it a sacred site. There are about 100 different climbing routes in the park. Less-experienced climbers can do their thing on the many boulders in the main canyon. If you're up for a serious rush - and have the skills to go with it - tackle some of the park's sandstone wall climbs: 2,000 feet! The 50 different crags (of varying difficulty) in this area have made this one of the top 10 destinations in America. To add to the mood, the town has a Bavarian theme; toast your success afterwards! Rock climbers travel to this mecca, considered the birthplace of the modern era of climbing. There are over 1,000 routes up the rock, some known as the most challenging anywhere on Earth. Easily one of the most beautiful - and popular - destinations for climbing. There are about 8,000 different routes available, with plenty of cracks and sharp edges to utilize the ascent. The scenery can't be beat, and the weather cooperates most of the year.